After you have prepared input (DOCK Blaster:Prepare Input) and submitted a docking calculation, the data you uploaded is checked in various ways to avoid failure later in the pipeline. This page describes the steps taken by our automated scripts, the messages you may receive, and what to expect as your job progresses. Normally, the initial docking calculation should take between 15 and 30 minutes, but this will depend on your target and the load on our servers. If the preliminary calculations complete and are satisfactory, you may choose to perform large database docking. Your data are uploaded to the server and checked for consistency, integrity, and completeness by the Submission Scrutinizer. The submission scrutinizer will conclude with one of four verdicts. 1. The data you uploaded were complete and did not need to be modified in any way. 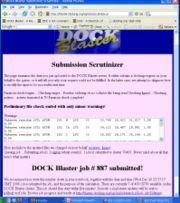 Docking has been submitted to the queue. Proceed to the Job Watcher. 2. Minor changes to the data you uploaded were required. These changes, which are reported back to you as warnings, have been made on your behalf, and the job has been submitted. Proceed to the Job Watcher. You may download the changed versions of the input files. 3. Major changes were required to the input you provided. These changes may or may not be what you wanted. Therefore, please examine the list of changes made and the updated files, and decide whether you wish to submit them or start over with modified input. If you choose submit, proceed to the Job Watcher. Otherwise, go back to the main input page. 4. Unrecoverable problems were encountered while processing your input. The errors and other warning are reported. Proceed back to main job launch page. The Job Watcher gives you an at-a-glance overview of the current status of your job. Jobs progress through the following states. When the preliminary docking calculations have completed, you may be eligible to choose large database docking. In this case, the Job Watcher has three states. You may only run one large database docking calcuation at a time. 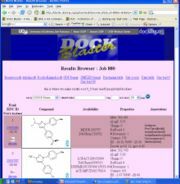 The results browser allows you to inspect the results of both preliminary docking calculations as well as large database docking calculations.